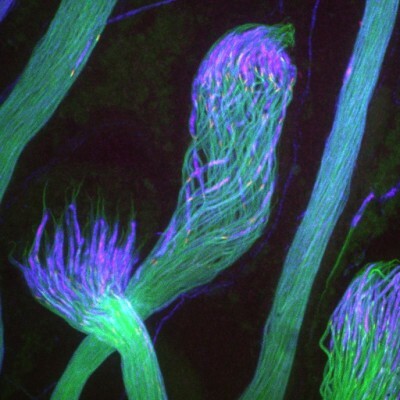 Immunofluorescence staining of a drosophila’s sperm flagella. Immunofluorescence on a Drosophila’s sperm flagella. 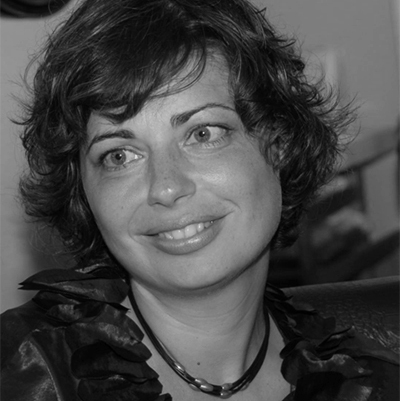 Mónica Bettencourt-Dias studies crucial structures in our cells, centrioles and cilia. She is investigating their biogenesis, evolution and misregulation using a variety of approaches, model organisms and patient samples. Centrioles are essential notably for the formation of centrosomes and cilia, crucial structures present in most of our cells (even all of them for the centrosome). Centrosome and cilia defects are seen in many cancers, brain development diseases and other disorders collectively known as ciliopathies. The molecular mechanisms of centriole and cilia biogenesis only recently started to be unraveled, permitting to address questions that have fascinated biologists for more than a century. How are centriole and cilia structure, number and function established, regulated and maintained in the eukaryotic cell, during development, in tissue homeostasis and in pathophysiological states? How did those structures evolve? Monica Bettencourt-Dias and her laboratory are interested in the counting, assembling and maintenance of centrioles, cilia and centrosomes, and their variations observed during development, evolution, and in disease. To address those questions they use a multidisciplinary approach. They identify new molecular players, combining bioinformatics with high throughput screening. They combine novel in vitro assays and studies in model organisms to quantitatively dissect mechanisms and validate them at the whole organism level. They take their work to the translational level by studying the misregulation of centriole and cilia in patient samples through collaboration with medical doctors. They study the evolution of those structures using both bioinformatics and synthetic biology approaches. Using those approaches, in the last seven years, Monica Bettencourt-Dias and her group have discovered novel mechanisms that regulate centriole biogenesis in space and time, through positive and negative feedback loops that control the activity of a master regulator identified by us, PLK4. Moreover, they have shown that a conserved group of proteins defines centriole architecture in eukaryotes, and molecular innovations coordinate centriole and cilia biogenesis, maintenance and function to different cellular contexts, within an organism and across evolution. Finally, they have discovered novel mechanisms by which centrosomes are altered in human cancer and have also described how cancer cells survive to those changes. July 2014, Nat Rev Mol Cell Biol. Jul 2011, J. Cell Biol.